Massacre at central Paris offices of satirical news magazine Charlie Hebdo; footage shows moment Kalashnikov-wielding gunmen storm office. 12 people have been killed in a shooting attack at the offices of French satirical news magazine Charlie Hebdo in central Paris. Two of the dead are reportedly police and ten are journalists; some reports say two of the journalists are the paper's cartoonists. Ten people are reported injured, five of them critically. At least two or three gunmen are believed to have been involved, according to Le Figaro. They were said to be firing Kalashnikov semi-automatic assault rifles. According to the paper, the gunmen are on the run after a shootout with policemen. Rocco Contento, a spokesman for the Unité police union, told reporters that three attackers got into a getaway car driven by a fourth man and drove to Porte de Pantin in north-east Paris, where they abandoned the first car and hijacked a second – turning the driver out into the road. He also said the Charlie Hebdo offices were under guard and that police protection had increased in recent weeks because of fresh threats against the magazine. Channel 2 is now reporting (update: 3:30 pm) that the staff had been in the middle of its weekly meeting when the shots rang out. Four of the caricaturists are among the dead - named as Charb, Cabu, Wolinski and Tignous, according to Le Monde. This is reportedly the deadliest terror attack in France in 50 years. Videos uploaded to Youtube show the attack as it took place. Warning: the first video contains disturbing images. France Info radio has been speaking to eyewitnesses, several of whom are journalists from a press agency located in the same building as the Charlie Hebdo offices. “We heard shouting in the street,” one of them, Benoit Bringer, told the station. “We saw hooded men carrying Kalashnikovs enter the building. We called the police. After a few minutes we heard heavy firing, a lot of firing. We went upstairs onto the roof. Britain's Telegraph quoted Luc Poignard, a union official, as saying the attackers had escaped in two vehicles. "Several men in black cagoules [balaclavas] were heard to shout 'the Prophet has been avenged'", wrote Pierre de Cossette, a broadcast journalist with Europe1 News. Reports say President Francois Hollande was on his way to the scene and would later hold an emergency government meeting. The Associated Press news agency cited a witness who said multiple gunmen were involved in the attack. CNN reported that two gunmen had entered the building and that shooting lasted for about five minutes. The magazine is based in Paris's 11th arrondissement. The latest tweet published by the magazine's official twitter account appeared to be a cartoon of Abu Bakrk Al-Baghdadi, the leader of Islamic State (ISIS). Charlie Hebdo published cartoons of the Muslim prophet Mohammed in 2012, leading France to temporarily close its embassies and schools in more than 20 countries amid fears of Islamist reprisals. 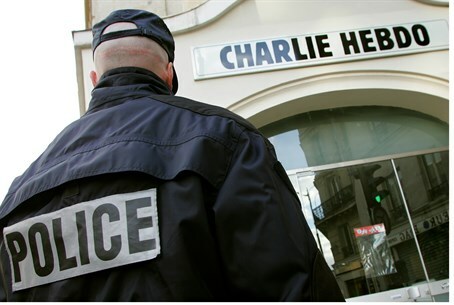 The offices of Charlie Hebdo were also burned down on November 2, 2011. A firebomb was lobbed into the offices of the paper at about 1 a.m., igniting a blaze. In 2005, Danish cartoons of Mohammed sparked a wave of violent protests across the Muslim world.